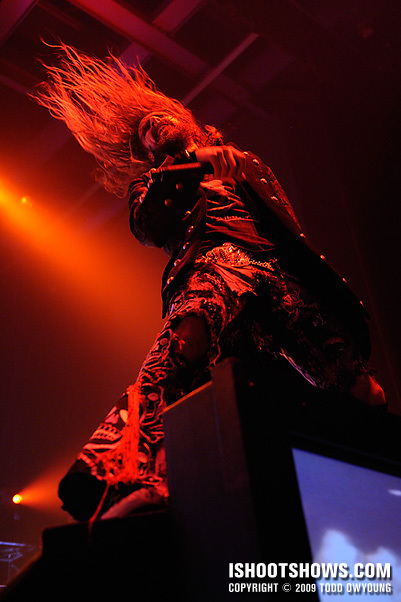 Rob Zombie stormed the Pageant on his “Hellbilly Deluxe 2 Tour,” bringing an onslaught of hair whips, devil horns, and massive red lighting. Going into this show, I was very, very curious as to what the lighting would be like. From all that I'd read, heard, and seen, the lighting for the first two songs seemed to be dominated by red light with a little in the way of hot cyan accents. As it turned out, this was pretty true overall. Red washes did make up the majority of the stage effects, creating a hierarchy between the band's antics on stage and the graphics projected at the back of the stage and on three video screens at the front of the stage. Add to this the fact that Rob Zombie and company go running/leaping from video screen to video screen (they casings that basically made them into small ramps/platforms) and the challenge was even higher. 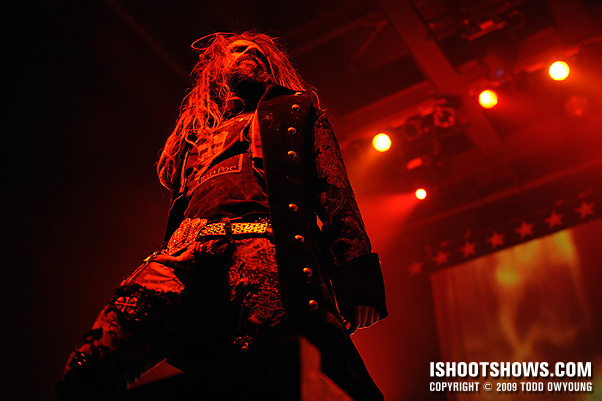 Still, Rob Zombie puts on an incredibly lively show and I think that even with all the above factors, he makes for a charismatic subject. 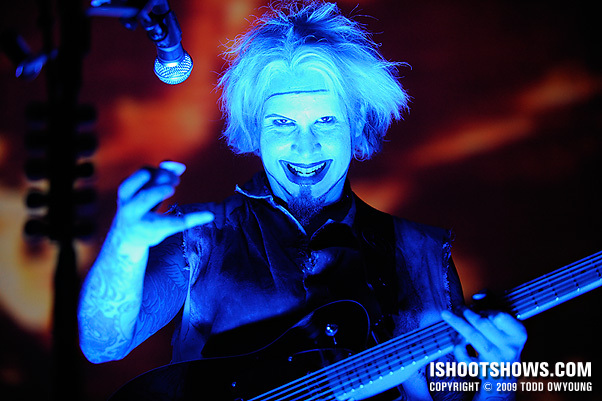 John 5 was also a fantastic subject for this show and mugged for the camera on several occasions during the two-song limit. 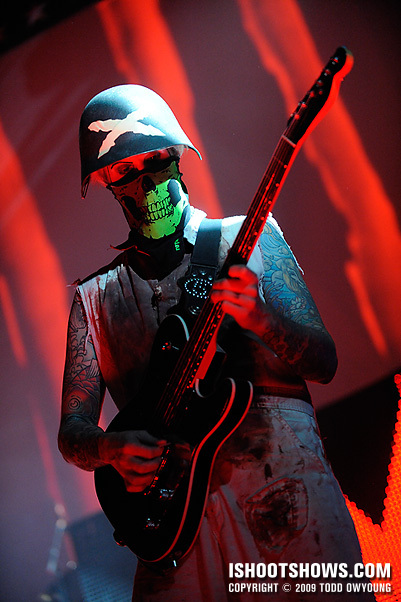 The challenges and song limit being what they were, I focused entirely on Zombie and John 5 for this show. If you're wondering about how I dealt with the excessive red lights for this show, you can check out my article with a few techniques for cleaner images with this sort of stage treatment here in the the Q&A section. Wow. That looks really tough. Red lights, fast action, and high stage = photographer nightmare. You handled it very nicely though. Would you say this is one of the more difficult shows you shot? Was thinking about shooting this in NYC, now not so sure. Thanks for the comment. If Zombie is playing Hammerstein, it might be better than the Pageant, the stage of which starts at five-feet. So, after the screen/monitors, it was a good 6-7 feet up to Zombie’s feet. Overall, because the red lights are not changing that quickly, you can basically shoot on one exposure for a good deal of the show, so in that sense it’s not that bad. The Love Drunk Tour that I shot on Friday w/ Boys Like Girl & Cobra Starship seemed much more tough to photograph simply because the lights change so quickly (especially for Cobra). I say, if you like a challenge, go for it. I was a little worried about this gig before hand since I’d seen only red/blue images, but it wasn’t as bad as it could have been in hindsight. Yeah, brutal is a good descriptor for the lighting on this tour – lots of things that combine to make a tough gig for the live music photographer, as Natasha said. I’m glad I photographed this show, though, as I missed Zombie a few years ago and heard it was a great gig. 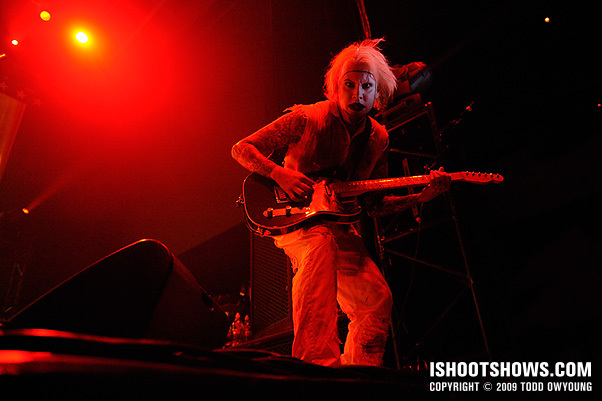 Great Portraits of John5… damn, he was really playing with your camera. Yup, John 5 was a great subject. Gotta love when they give a little eye contact. For once the total red wash actually came out looking good. Nay – AWESOME. Incredible use of red/black, Todd. I’m impressed and inspired. Those first two shots are absolutely brutal. You’re my favorite. 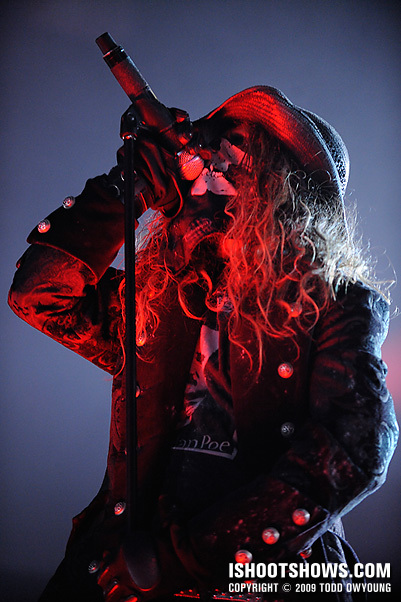 Nice to hear from you here, thanks for the feedback – Red did seem to fit with the show and Rob Zombie’s aesthetic – the only white light we saw came in the form of a little spastic strobing from the back of the stage during the first song. Great shots once again. The red lighting is really reflective of RZ for sure! Can’t wait to see what you show us with Megadeath. Thanks for the comment. Megadeth should be very interesting, as it’s at a smaller venue here with a relatively low stage. I’d love to do something for Megadeth like I did for Social Distortion. I was very curious as to what kind of shots you would get from this show as I shot the band about a week prior. You, of course, handled it very nicely although I had no doubt that you would. Your shots look great as usual. Thanks for the comment, I really appreciate you writing me to give me a heads up about the tour. 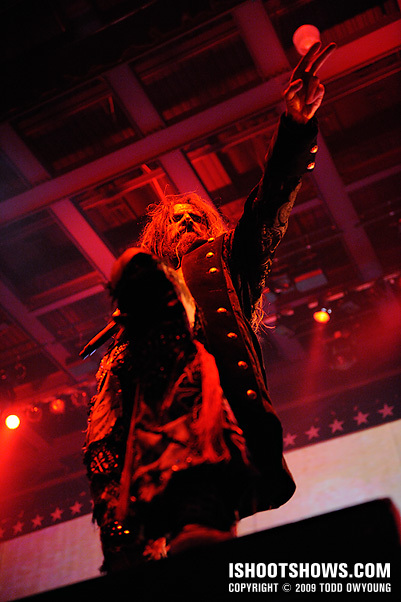 Though the conditions weren’t ideal, Rob Zombie puts on great show, as you know. Thanks again. Wow. That second pic actually brought a little fear into me due to the expression. Great stuff as always! Here’s hoping you had a massive bottle of aspirin and some chamomile tea to deal with the headache you probably got from the red lights and other challanges. Brutal. 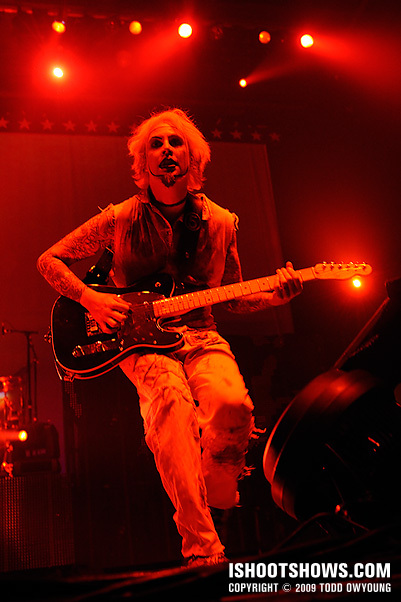 Yeah, John 5 has quite the stage persona, doesn’t he? He looked right at me a few times during the show. Though this was a pretty challenging shoot due to the height and the red lighting, it could have been worse. The constraints of the lighting and where RZ would be actually made up for some of the difficulties. Thanks for the kind words, glad to share what info I can. I shot RZ at ISO 1600 for the most part at f/2.8, while the shutter speed hovered around 1/250 or so, though I did bump up the ISO to 3200 at some points as well. Did you shoot the Nekromantix? Brutal lighting conditions but very well handled Todd. Rob Zombie and John 5 both look suitably scary. 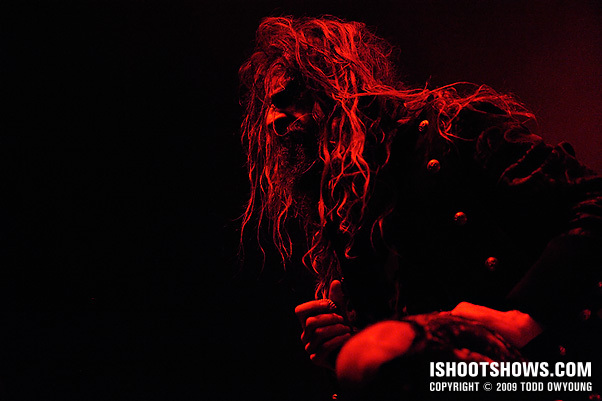 I am just getting started in concert photography and I’m also a huge Rob Zombie fan. Love the photos Todd. I know the pain of those red lighting conditions. I had to shoot that type lighting with Chevelle and had a lot of pics not turn out. 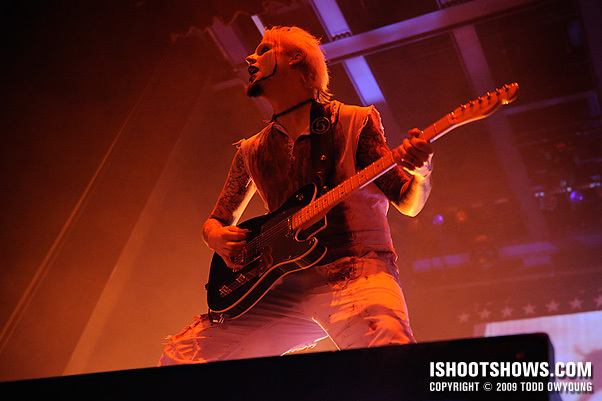 Love the blue lit John 5 picture. Thanks for the comment. I shot Chevelle a couple of years ago, and if their lighting now is anything like it was then, it was tough. Lots of red lighting. Good luck with your live music photography.